If today’s ranchers and hunters had their way, bison, along with wolves and grizzly bears, would be forever restricted to the confines of the park. Rancher-hunters already have such a death-grip on Montana’s wildlife that bison are essentially marooned and forced to stay within park borders, battling snow drifts no matter how harsh the winter, despite an instinctual urge to migrate out of the high country during heavy snow winters. The award for Most Ridiculous Spin of the Century goes collectively to Kit Fischer, sportsmen’s outreach coordinator with the National Wildlife Federation (what the hell kind of environmental/wildlife advocacy group hires an outreach coordinator to attract sport hunters? ); Dave Chadwick, executive director of the Montana Wildlife Federation; Jim Posewitz, board member of Helena Hunters and Anglers; Casey Hackathorn, president of Hellgate Hunters and Anglers; Chris Marchion, board member of Anaconda Sportsmen and Glenn Hockett, president of Gallatin Wildlife Association. 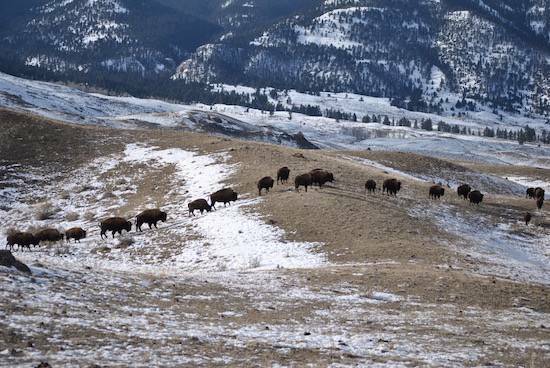 These revisionists recently had the insolent audacity to try to boast that “hunter-conservationists saved bison from extinction a century ago” in their article, Enlist Montana Hunters to Manage Bison Numbers. Let’s not forget that the vast herds that once blackened the plains for hundreds of miles on end were almost completely killed off by hide-hunters, market meat-hunters or by sport-hunters shooting from trains just for a bit of fun. The only reason hunters stopped the insanity was that the bison were all but completely wiped out. By the time they ended their killing spree, only 18 wild bison remained, holed up like wrongfully-accused outlaws in the upper reaches of the Yellowstone caldera. Although Yellowstone National Park is now synonymous with the shaggy bovines, bison would prefer to spend their winters much further downriver, on lands now usurped and fenced-in by cowboys to fatten-up their cattle before shipping them off to slaughter. Parts of this post were excerpted from my book, Exposing the Big Game: Living Targets of a Dying Sport.